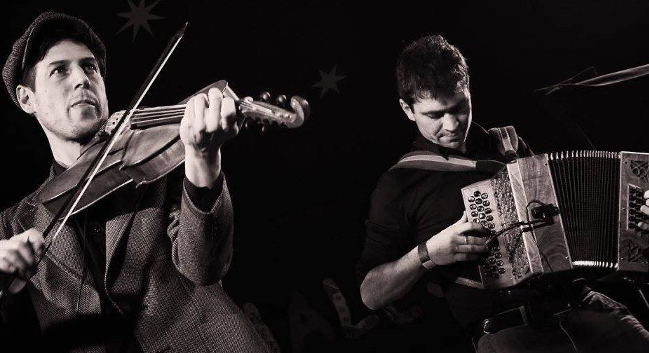 Bursting out of Europe for their first ever UK show, brothers-in-music Baltazar Montanaro and Pablo Golder play energetic, pumping folk music on violin and diatonic accordion that is guaranteed to bring a smile to your face and a tap to your feet. You might even want a to find a corner to dance! Combining French, Hungarian, Italian, Belgian and English heritage in just two musicians, these itinerant players can be found year in and year out touring up and down the European continent (and as far as New Zealand), but have somehow never made it to the UK as a duo. Old friends with many shared tales, the wit and interplay between the two will delight any crowd. The pair will be showcasing their brand new third album, ‘Vivat Vivare’, and if we’re lucky Bal might even bring some of his delightfully comic books of poetry and illustration. Come along and beat the Brexit blues!